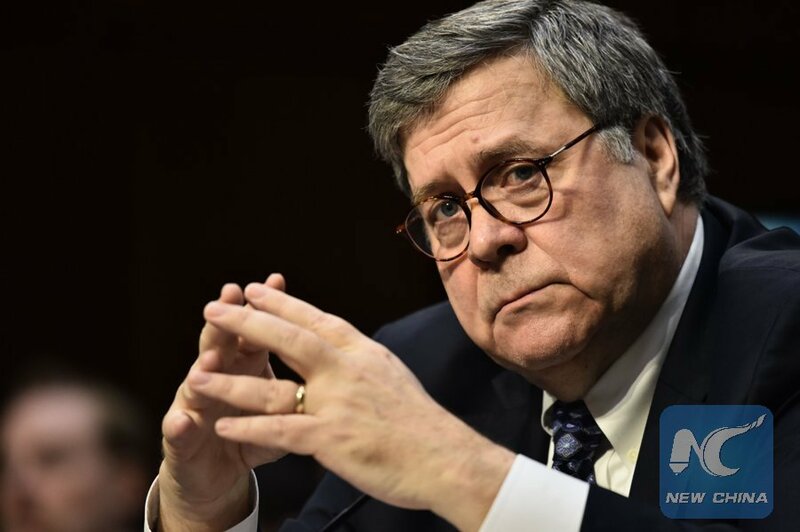 WASHINGTON, Jan. 15 (Xinhua) -- U.S. Senate started Tuesday the confirmation hearing of President Donald Trump's attorney general nominee William Barr, focusing on the ongoing Special Counsel Robert Mueller's Russia investigation and its final results. Testifying before the Senate Judiciary Committee, Barr said the president would not be allowed to "correct" the final report Mueller is expected to submit to the Justice Department at the conclusion of his investigation. "That will not happen," Barr told lawmakers, responding to earlier claim by Trump's personal attorney Rudy Giuliani that Trump's legal team should be permitted to correct the report. Barr said that he wouldn't allow himself to be influenced or "bullied" by anyone, "whether it be editorial boards, or Congress or the president." "I'm not going to do anything that I think was wrong, and I won't be bullied into doing anything that I think is wrong," Barr said. He also insisted that he would allow Mueller to complete his probe and would work to make the findings public in accordance with the law, noting that he doesn't believe Mueller "would be involved in a witch hunt." "Under the regulations, Bob Mueller could only be terminated for good cause and frankly it's unimaginable to me that Bob would ever do anything that gave rise to good cause," Barr said. "I believe right now the overarching public interest would be for him to finish." "I believe the Russians interfered, or attempted to interfere, in the election and I believe we have to get to the bottom of it," Barr said. In his prepared written testimony released on Monday, Barr also said he believes "it is in the best interest of everyone -- the President, Congress, and, most importantly, the American people -- that this matter be resolved by allowing the special counsel to complete his work." Once confirmed, Barr would assume oversight of Mueller's probe into the alleged Russia meddling in the 2016 U.S. elections and ties with the Trump presidential campaign, as well as potential obstruction of justice by the president during the FBI investigation. It will also be up to the attorney general to decide whether the final report of the Mueller probe is released or partially released to Congress and the public. Trump, who has repeatedly slammed the Mueller probe as a "witch hunt," nominated Barr last month to fill the void left by Jeff Sessions, who recused himself early in his tenure from the Russia probe and resigned at Trump's request one day after Nov. 6 midterm elections. "I think he will serve with great distinction," Trump said at the time, describing Barr as "a terrific man, a terrific person" and "my first choice from day one." In the wake of nomination, a New York Times report said Barr has long advanced a vision of sweeping presidential powers and has criticized aspects of the Russia investigation, including suggesting that Mueller hired too many prosecutors who had donated to Democratic campaigns. At Tuesday's hearing, Barr committed to seeking the advice of career Justice Department ethics officials on whether he should recuse himself from the Mueller probe because of his past comments, while stressing that he would make the decision himself "in good faith" and based on the laws and facts. Barr, 68, a Republican and corporate lawyer, served as attorney general from 1991 to 1993 under President George H.W. Bush. After graduating from George Washington University's law school, Barr served for the Central Intelligence Agency in the 1970s and later worked in the Reagan White House before leaving for private practice. In 1989, President George H.W. Bush appointed him to lead the Justice Department's powerful Office of Legal Counsel, later elevating him to deputy attorney general and then attorney general. After the Bush administration, Barr spent most of his time in telecommunications, joining GTE in 1994 and staying on after it merged with Bell Atlantic to become Verizon Communications Inc. He now works at Kirkland & Ellis as a lawyer.